A new study shows that nighttime illumination is increasing around the world. Our nights are getting brighter and they have been every year since 2012, according to a new study published today in Science Advances. Researchers led by Christopher Kyba at the GFZ German Research Centre for Geosciences used satellite imagery to track changes in nighttime outdoor artificial lighting around the world and they found that between 2012 and 2016, the amount of lit area grew by 2.2 percent per year. The amount of brightness from continuously lit areas also increased by 2.2 percent per year. So not only is more area being illuminated at night, already lit areas are getting even brighter. "We're losing more and more of the night on a planetary scale," said the journal's editor, Kip Hodges. Some areas stayed largely the same year over year, but many of those regions, including those in Italy, the Netherlands, Spain and the US, were already among the brightest to begin with. Lighting increased throughout South America, Africa and Asia. 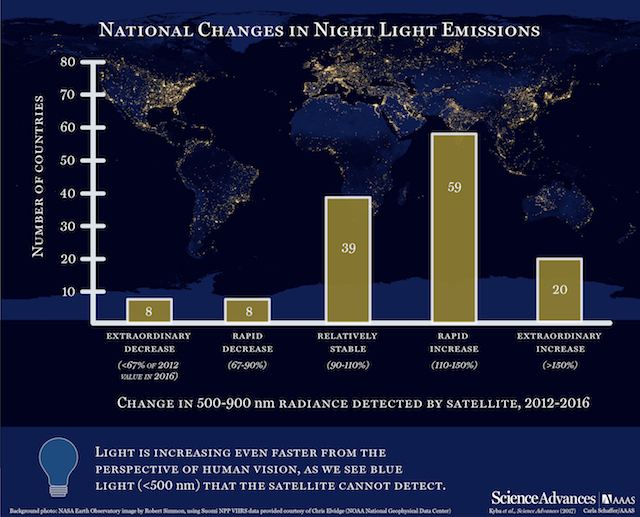 And the numbers are likely to underestimate the problem because the satellite used doesn't pick up blue light emitted by LEDs, which have been used more and more in the last few years. "The numbers are truly shocking, given that we know illuminating the nocturnal environment can have widespread ramifications for the environment and human health," University of Exeter researcher Thomas Davies, who wasn't involved with the study, told Gizmodo. And exactly how much it will impact human and environmental health is unclear since nighttime illumination is a fairly new phenomenon. "Artificial light at night is a very new stressor," said Franz Holker, one of the researchers on the project. "The problem is that light has been introduced in places, times and intensities at which it does not naturally occur and [for] many organisms, there is no chance to adapt to this new stressor." And unless we change how we're lighting our outdoor spaces, this trend will likely continue. "In the near term, it appears that artificial light emission into the environment will continue to increase, further eroding Earth's remaining land area that experiences natural day-night light cycles," said the study.